I don't think anyone will argue over the fact that Cocoa Puffs is a sweet cereal. Personally, I've always liked the cereal. I admire its crunch and the way it produces quality chocolate milk. And maybe it's just a sign of respect, but I would never squeeze the individual balls together and pour frosting on them instead of milk. Unfortunately, that pretty much sums up the new Cocoa Puffs Milk 'n Cereal Bar. The "milk" is not like milk at all, but is more like the creamy filling of an Oreo cookie. For Cocoa Puffs - the cereal, real milk changes the character of the nuggets while allowing them to be individual identities. This is because the milk offsets the sweetness. In Cocoa Puffs - the bar, the "milk" filling serves to compile the sweetness and the result is a sugar overload. On the plus side, each 160 calorie bar is surprising filling and does contain 25% of the daily recommended amounts of calcium and Vitamin D. But the hard facts remain. If you want sweet, there are hundreds of better candy bars. If you want nutrition, Balance Bars, Power Bars and Slim Fast Bars are superior choices in both nutrition and taste. What do you think of Cocoa Puffs Milk 'n Cereal Bars? 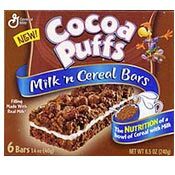 I don't know why they took the Cocoa Puffs cereal bar off the market. I really liked it. I know they don't make this flavor anymore, but I really enjoy the Cheerio's ones. They're great on the go. 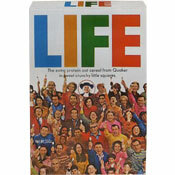 We loved these but can't find anymore, especially the box with only this flavor. Wish they'd bring 'em back. Now trying to find a way to make at home. These are really great snacks. Can't find them anymore except in the triple pack with the other two cereal bars, which I do not like. Why can't you just sell boxes of the cocoa puff milk n cream and not force the other two flavors on your customer. I'm not buying a 6 pack to only enjoy two of the sic bars in the box !!! I can't find this product anymore. Is it discontinued ? I love this cereal bar. I can't find it in a box by itself... only in a variety box and I don't like the other two in the box with it!!! They are great for dessert or a snack but not for breakfast. Try other cereals like Count Chocula, Frankenberry and Booberry just for Holloween. I'm surprised you rated these so low, as with the majority, I'm going to have to disagree with you. These are delicious. These cereal bars are really good. I agree that its not real milk, but when your busy and on the go, you don't have time for real milk. and kids love the cream filling and the cereal bars. High fat and saturated fat. My son LOVES these. Please bring them back. It is not your choice what I feed my son. Review by Amanda and Jim. Amanda: -taking the first bite- UCK!! Jim: -from a cocoa puff lover standpoint, i came in with high expectations. those expectations were matched upon my first bite, yet i was left wanting something more... and furthermore, i enjoyed the convenience of cereal on the go. You need to bring the cereal bar back!! It's the only one my son will eat out of the variety pack.. HELLO!!! Don't be stupid.. I love these bars... They taste very good to me and are much better than what I could otherwise eat on the quick and have pretty decent nutrition to be so sweet. I don't get the "frosting" comment at all. I have to disagree with your review of these bars. I often eat them as a snack when I'm on my way to class (I'm a college student) or when I'm jonesin' late at night. I never felt like I was getting to high a sugar-rush and I think they are a much better thing for kids to eat than the sandwich this site gave a 7/7 from McDonald's. This thing will kill someone fairly quickly! It's a McMonster and you gave it a 7/7 and gave General Mill's revamp of a classic cereal a 2? Oh sirs... you've lost your way. All three of my kids love them and eat them for a snack instead of breakfast. I was getting them through Amazon and am sooo disappointed that we can't get them. The kids don't like the Honey nut or Gramham kind enough to make it worth buying the variety pack. I would say that the cocoa puffs milk n' cereal bars are over rated. You do not get that much nutrition and they are too sweet for breakfast, now for dessert, they work out just fine! Have you ever eaten about 10 sugary treats when you endulged yourself? And gotten that yucky too much sugar feeling. If you like that feeling try one of these today!!! UGH! I love these, and I'm so sad that we can't get them any longer. Yes. They are sweet. Cocoa Puffs in general are sweet. But they are what they say - the nutritional equivalent of a bowl of cereal served with milk. Not only that, but in the true size of one serving of cereal and milk. My favorite breakfast! I strongly disagree with you rating cocoa puffs milk and cereal bars - only a two out of a possible seven golden eggs. The bars are fantastic and deserve much more credit than that. The chocolately taste with the milk combined into a bar gives your mouth such a magical sensation. The taste stays with you for a long amount of time and it is a splendid feeling to have throughout the day. I hope that you will take notice to my email and reconsider your thoughts on this truely great cereal bar.